Beyond Organic started small and grew and grew. So she bought a 4 1/2-foot tall indoor Tower Garden by Juice Plus that uses aeroponics (water, liquid nutrients and a soilless growing medium). Seedlings that were germinated in rockwool, a soilless growing medium, will be transplanted into the towers where water and liquid nutrients circulate feeding the plant as it grows. Then she had another idea that began to grow. She wondered how she could bring locally grown, delicious, organic greens, microgreens and herbs to the local community. Maybe even open an organic juice bar. “We” included her husband David Reid, the owner of Reid Sod Farm, Freehold, and a fourth generation farmer, and her son Matt Engleke, who works closely with her at Beyond Organic. Two years later, Reid has a 3,500-square-foot greenhouse with 15,000 plants that grow in 144 aeroponic 10-foot tall towers filled with nutrient rich water. Radiated heating in the floor enables growing throughout the winter. The initial investment was $350,000 for the greenhouse and towers that use 90 percent less land and water than a conventional farm, she said. Matt Engleke, Theresa Reid’s son, tends to some of the greens and herbs grown in vertical aeroponic towers at Beyond Organic. There’s no weeding, but strict monitoring of the pH balance and nutrients is a must. Ladybugs and grasshoppers take care of any bugs in the summer and organic Neem oil does the job in the winter. On a recent hot summer day the windows were open, the fans were blowing and the sound of dripping water all around you was soothing. “I like to grow stuff I can’t find in grocery stores, like lemon basil, Thai basil, garlic chives, tangerine edible marigolds, escarole that is sweet, and thin stalks of celery that are amazing,” she said. “We have butter crunch (lettuce) growing that has a really mild butter aftertaste. It’s delicious. Everything here is about flavor. Mustard leaves have been popular recently, she noted, especially one with a spicy horseradish kick that can bring tears to the eyes. There is no mistaking the distinctive tangerine taste of a marigold leaf. She grows them at the request of Fresh Kitchen in Sea Girt. Chef Meg LaManna at 26 West on the Navesink in Red Bank requested red sorrel for its tart lemon taste. 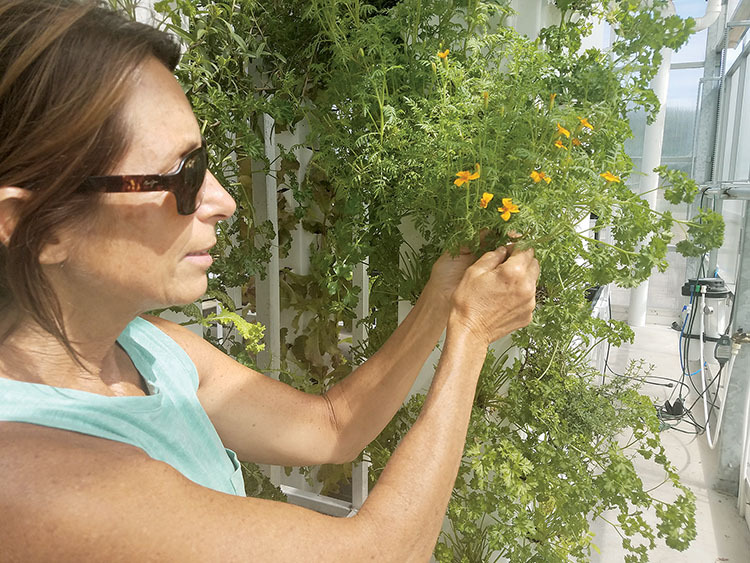 Theresa Reid, owner of Beyond Organic, plans to open a juice bar in the building in front of her 3,500 square-foot greenhouse at 89 Howell Road in Howell where she grows 15,000 plants in aeroponic towers. “We make sure we grow plenty and always have that ready for them,” Reid said. Currently 12 restaurants are clients, including Kitch Organic in Red Bank; d’jeet in Shrewsbury; Blue Grotto in Oceanport; Rooney’s and Trama Trattoria in Long Branch; Tre, 618 and the Metropolitan Cafe in Freehold; the Shipwreck Grill in Brielle; and Local Urban Kitchen in Point Pleasant Beach. But chefs don’t get all the fun. Greens, herbs and microgreens (including pea shoots and wheat grass) are available to the public in a 4-ounce bag. Seedlings are available at $2 each. “It’s funny. Now people are buying nasturtium for their dishes at home,” she said. “Normally that’s the thing they push aside on their dish in the restaurant. Everybody’s getting an education.” That includes Girl Scout and Boy Scout troops and a special education school group that toured the greenhouse. Adults are learning as well. Farm-to-table dinners held in the greenhouse are popular and bookings for private parties are increasing. For the dinners, a guest chef prepares a multicourse meal paired with wine inside and cooks on an old propane tank converted into a wood-fired grill with an oven and two burners outside the greenhouse overlooking 210 acres of the sod farm that also includes Reid’s home. “White linen tablecloths. Live music. The setting sun. People love it,” Reid said. “They sit at these long tables and they talk to each other. They take each other’s number and come back in groups. It’s a lot of fun. “Dinners were not part of the plan, but they are now,” she said, adding she plans to expand with a tent, add a container organic vegetable garden and book more events next summer. Last Sunday, Beyond Organic hosted an 80th birthday party. This article was first published in Sept. 14 – Sept. 21, 2017 print edition of The Two River Times.